Like many coastal communities in the Great Lakes Basin, Monroe, Michigan, relies on water drawn directly from one of the five Great Lakes: Erie. Chris Knight, the superintendent of Monroe’s water treatment plant, oversees the production and daily delivery of drinking water to 48,000 customers in the city and nearby communities. They work in a facility built in the 1920s. The plant draws, on average, 7 to 7.5 million gallons of water directly from Lake Erie per day. On any given day, 85 to 90 percent of that water is distributed to customers. Knight and 10 co-workers keep an eye on the treatment with a combination of real-time electronic monitoring systems and good old-fashioned visual inspection. They monitor organic matter, pH (a measure of acidity and alkalinity) and hardness to assure customers of a steady year-round supply of safe drinking water. “The pH of Lake Erie is normally in the 8.0–8.2 range,” Knight said. But one summer in the early 2000s, he and his staff noticed the pH of raw water coming in from Lake Erie had risen to 9.0 — much more alkaline than expected. Carbon dioxide (CO2) is a major contributing factor in keeping pH low by combining with water to form carbonic acid. This weak acid is present in all surface waters and is vital to the health of lake ecosystems. When Knight noticed the water’s pH rise to 9.0 and its turbidity, or cloudiness, increasing, he became alarmed and took measures to bring the pH back into the desirable range by adding extra aluminum sulfate—or alum—into the treatment system. Alum is a routine step in the treatment process and is mostly used to pull out organic matter and clear up water. It can also be used, as it was that day, to bring down pH levels. Seeing such a rise in the pH of Monroe’s water led Knight to assume that an algae bloom in the lake was sopping up the CO2. 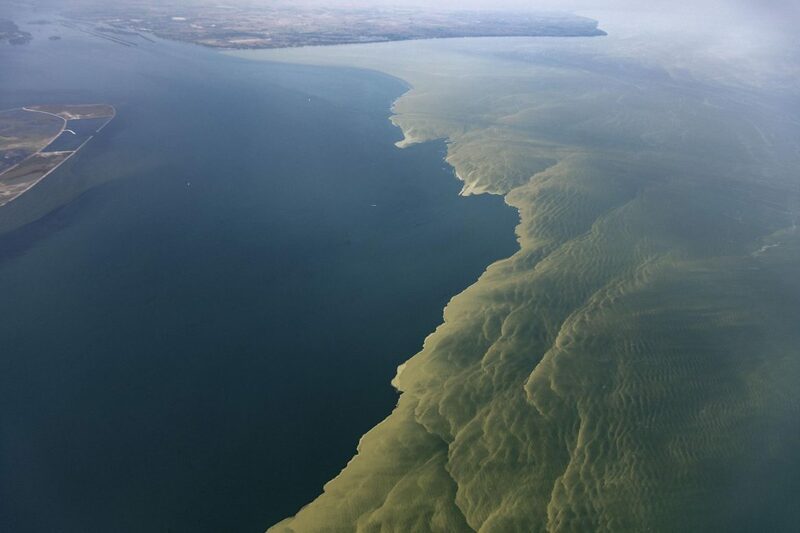 The sudden appearance of a potentially toxin-producing species of algae in the water supply was unexpected and alarming, suggesting that conditions in Lake Erie had changed, allowing the bloom to develop, he said. “The first time we saw one (algae bloom) was in the early 2000s, but back then we thought it was regular algae. It would change the water characteristics, the pH would go up, but nobody thought it would be blue-green algae,” Knight said. Numerous algae species in Lake Erie are important to the ecosystem, including species of cyanobacteria, sometimes known as blue-green algae. Some blue-green algae contribute to harmful algal blooms by producing toxins that are potentially dangerous to humans and animals. Blue-green algae wasn’t a problem in the past for Monroe, however. Tim Davis, a molecular microbiologist at Bowling Green State University in Ohio researches how climate change will impact harmful algal blooms. He looks at how the physiology and genetic makeup of microcystis, the major type of cyanobacteria associated with toxin production, responds to the changing environment. “There is much about the ecology of microcystis we don’t know,” Davis said. What is known is that the blooms in freshwater ecosystems are caused mostly by nitrogen and phosphorus from human activities like farming. Compounding the complexity of the algal bloom issue, not all blue-green algae are microcystis and not all species of microcystis produce toxins. Finding blue-green algae in a water supply doesn’t necessarily mean toxins in people’s drinking water. In 2012, Monroe installed a probe at the treatment plant’s water intake after noticing an algal bloom influencing the city’s water quality. The probe provides real-time readings of a pigment found in cyanobacteria as an indicator of blue-green algae at the intake pipe. The plant now tests for levels of the pigment once per week from the first Wednesday in July through November. If levels rise, indicating a cyanobacteria bloom, plant personnel test raw water to see whether the cyanobacteria present are toxin producers. Fortunately for residents of Monroe, unlike some other communities, their water treatment plant uses ozone to disinfect the water and destroy the toxin. Harmful algal blooms won’t necessarily harm coastal communities’ water supplies unless the blooms and toxins are present near the intake systems. The notorious harmful blooms in Lake Erie in 2014 that caused major concern for Toledo didn’t affect Monroe residents although the communities are only 20 miles apart. The ability to predict when blooms may develop in lakes and project their movement is the focus of research by scientists at the National Oceanic and Atmospheric Administration’s Great Lakes Environmental Research Laboratory (GLERL) in Ann Arbor. GLERL scientists can predict the development of harmful blooms and model their movement to alert coastal community water systems of potential problems. The scientists are collaborating with other researchers to develop a buoy that can draw in a water sample, extract the DNA from algae and run tests to look for organisms that can produce toxins. The data would be relayed via satellite to the laboratory. Once implemented, the technology could provide an early warning system for water managers in the Great Lakes Basin, helping them know when to be on alert for harmful blooms at their water intake stations. It’s also important to understand that not all blooms in lakes are harmful, said Bowling Green’s Davis. Indeed, regular blooms of microscopic plants and animals are necessary to the health and productivity of the Great Lakes. For example, the normal spring bloom is “absolutely critical in fueling the zooplankton populations which are preyed upon by bait fish, which are preyed upon by commercial sport fish. “Productive regions have great fisheries because they are just that: They are productive,” he said. This article is a classic case of a “limited hangout”. It is a partial exposure of the much greater crimes that have gone on for many decades. Its a limited hangout on multiple levels. First there is the fact that industrial agriculture not only pollutes with fertilizer that cause algae blooms. It pollutes with tremendous amounts of pesticides and herbicides, such as RoundUp. Secondly there is no mention of the tremendous variety and amount of industrial pollution (such as dioxins) that poison Lake Erie. No mention of the tremendous amount of pharmaceuticals that get through waste water “treatment” plants. It doesn’t matter if all toxic algae were eliminated. I wouldn’t breath the vapors from that lake. Dead Waters Coming To A Great Lake Near You! We Personally witnessed Unhealthy Algae Blooms decimate the West Coast in the 80s with Red Tides nearshore wreaking havoc with the ecosystem, making many sick and no more fish to be caught. Now it is here because of all the pollution from encroachment and inadequate sewage management. Our own effluent, mindless dumping of toxins, plastics, and metals will be the death of us all here around the great lakes if we don’t get this sorted, and quickly. I’ve said it before I’ll say it again it’s not what goes into the lake it’s what stays in the lake because the New York power Authority’s ice boom has stalled the natural conveyor Lake Erie does not have the chance to reset itself and clean out the excess organic matter every year this is going to get worse the only possible way to save Lake Erie is to start back up the natural conveyor everything will get back to pre 1964 conditions in 3 to 5 years Google Joe Barrett ice boom for the truth.